Railpictures.ca - Jason Noe Photo: Looking back on my notes the last Goderich-Exeter Railway (GEXR) 584 I had photographed crossing King Street in Waterloo was on July 31, 2008. At that time, Uptown Waterloo still resembled what I had grown-up with and still had that familiar feel as the former CN Waterloo Spur cut through the Town Square mall parking lot guarded only by a couple small crossings with wooden cross-bucks that the conductor had to protect as the train made it’s way north to Elmira. Almost ten years later and the entire landscape of Uptown Waterloo is almost unrecognizable in some areas with the installation of the ION Light Rail network, the modernization of the mall and the newly overhauled street-scape efforts as well. However, despite all the changes, GEXR 584 still continued its Monday-Thursday evening runs to Elmira, now with an order time from Kitchener at 18:30 that only allowed daylight photography within a short window of time during the longer summer months on the Waterloo Spur. On June 13, 2018 just as the sun was setting on a cloudless evening, a young family has a front row view at GEXR train 584, crosses King Street with GEXR 2073 and GEXR 2303, hauling three tank cars for Elmira. | Railpictures.ca – Canadian Railway Photography – photographie ferroviaire Canadienne. 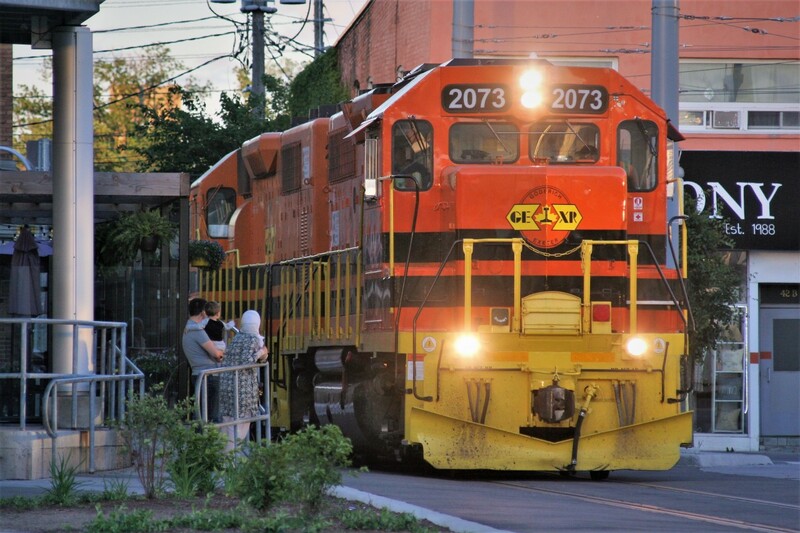 Caption: Looking back on my notes the last Goderich-Exeter Railway (GEXR) 584 I had photographed crossing King Street in Waterloo was on July 31, 2008. At that time, Uptown Waterloo still resembled what I had grown-up with and still had that familiar feel as the former CN Waterloo Spur cut through the Town Square mall parking lot guarded only by a couple small crossings with wooden cross-bucks that the conductor had to protect as the train made it's way north to Elmira. Almost ten years later and the entire landscape of Uptown Waterloo is almost unrecognizable in some areas with the installation of the ION Light Rail network, the modernization of the mall and the newly overhauled street-scape efforts as well. However, despite all the changes, GEXR 584 still continued its Monday-Thursday evening runs to Elmira, now with an order time from Kitchener at 18:30 that only allowed daylight photography within a short window of time during the longer summer months on the Waterloo Spur. On June 13, 2018 just as the sun was setting on a cloudless evening, a young family has a front row view at GEXR train 584, crosses King Street with GEXR 2073 and GEXR 2303, hauling three tank cars for Elmira. Thanks for the comments Graydon, Kevin and Steve. Great shot Jason! I love the human element to it! Nice one Jay!! I too managed to get em here a couple of times last summer including 06/21 when it was almost full sun but on the other hand, I’m still really wishing I could’ve been born a decade or so earlier so I could have shot em back when they still went on duty at 5 but a decade from now, I’m sure I’ll be forever greatful for my summer 2018 success! Great shot once again and just before the LRT opens (days or maybe a week prior) I hope to share a shot on here from mid July of 584 delivering 2 of the Light Rail Vehicles to the Region! It was a dusk shot like this one was well.